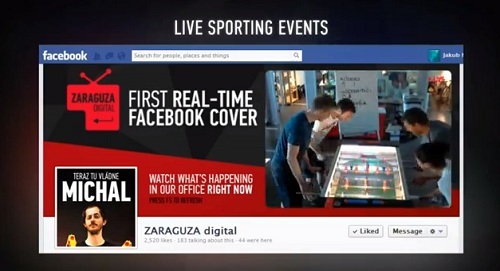 Zaraguza, a digital agency from Slovakia, has evolved an engaging Facebook innovation by launching a real time Facebook cover that shows live pictures from their office. This makes the experience of joining and interacting with the page more exciting. As you know, cover page is the large photo at the top of person's timeline above the profile picture. Facebook claims that people have a better experience viewing the timeline when they see a cover that is 'as unique as you are'. So Zaraguza showed the world how innovative an agency they are with this unique strategy. Watch it here. They even engaged with their fan base by allowing their messages to be featured on a board in their office that appears on their shifting cover page. They seem to be uploading photos from a mobile camera every 15 secs that gets added automatically through the Facebook API to the Cover Photos album and then the most recent image seems to get chosen as the cover photo automatically.